Manchester United midfielder Paul Scholes has won the Barclaycard player of the month award for January. It is the first time the England international has scooped the prize despite being part of the one of the Premiership's most successful midfield quartets of the past decade. The 28-year-old has been in a rich vein of form, scoring in every one of United's games during January. His goals have helped United keep pace with leaders Arsenal at the top of the table. 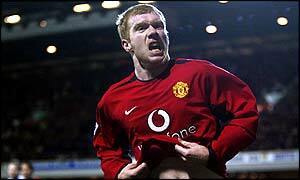 Scholes said: "I am delighted to win the Barclaycard player of the month award for the first time. "I'm very pleased with my form of late, and hoping I can help United keep the pressure on Arsenal at the top of the league." The Barclaycard Awards Panel said: "It is incredible to think that Paul Scholes has never won the player of the month award before. "His pace, eye for goal and intelligence in midfield have been central to United's recent improvement in form. "He will be a key player as United try to win the Barclaycard Premiership. "Eight league goals this season go someway to explain why this diminutive Mancunian is respected as one of the best players in the world at present."